The Shabab, the militant Islamist group with close ties to Al Qaeda, announced a “tactical retreat” from Mogadishu in August. But that doesn’t mean that peace has returned to Somalia. New evidence uncovered by The Nation’s Jeremy Scahill reveals that the Shabab may be shifting its strategy from holding territory to a guerrilla terror campaign. 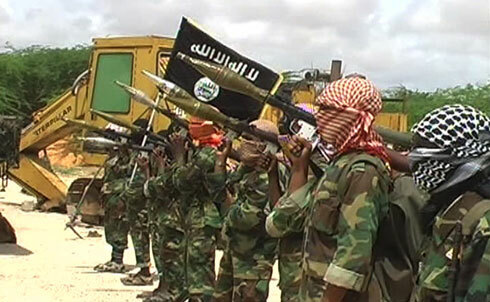 As Scahill and Big Noise Films’s Richard Rowley found when they traveled to Somalia recently, US proxy wars in the country have helped to create and strengthen an Islamic militant threat in the Horn of Africa. As paramilitary militias continue to vie for control of the Somali capital, Washington’s policies are once again ensuring that warlords will be the country’s most powerful players for years to come. 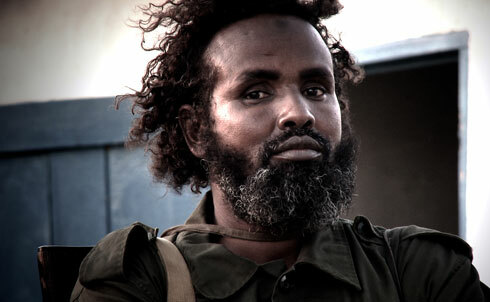 Yusuf Mohamed Siad, known by his nom du guerre “Indha Adde,” or White Eyes, was once a key ally of Al Qaeda and the Shabab. Today, the notorious warlord is a three-star general in the Somali military and receives weapons and support from the US-trained, armed and funded African Union force, AMISOM. A rival warlord, once heavily supported by the CIA, charges that Indha Adde and other warlords now fighting on the US side are playing Washington and the Somali government in an effort to keep their strongholds. Indha Adde points to a corpse of a Shabab fighter killed by his militia. “If we capture a foreigner we execute them so that others will see we have no mercy,” he says. Indha Adde talking with his commanders on the frontline near Mogadishu’s Bakara market. 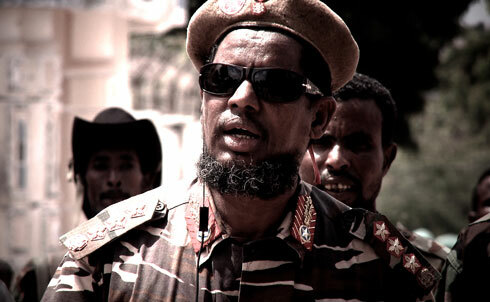 His militia has been a key force in fighting the Shabab. 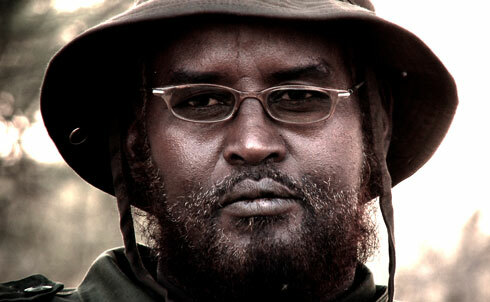 Abdulkadir Moallin Noor, known as “the Khalifa,” is a key leader of the Sufi muslim paramilitary group Ahluu Sunna Wa’Jama (ASWJ). 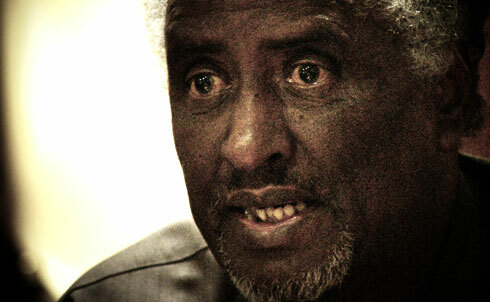 Educated in London, Noor returned to Somalia to succeed his father, a revered religious leader. 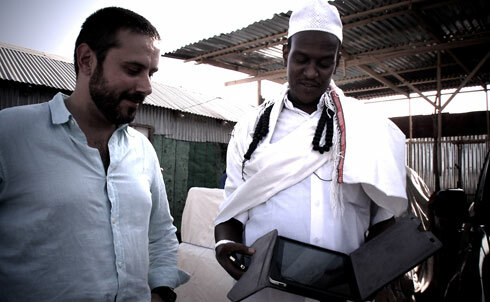 He rides around Mogadishu in an armored SUV with animal skins over the seats and reads his Koran on his shiny new iPad. ASWJ views itself as the antithesis of Wahabis and Al Qaeda and a natural fit for a close friendship with the United States. The group took up arms in late 2008 when the Shabab and Al Qaeda forces began desecrating the tombs of ASWJ elders and assassinating its leaders. 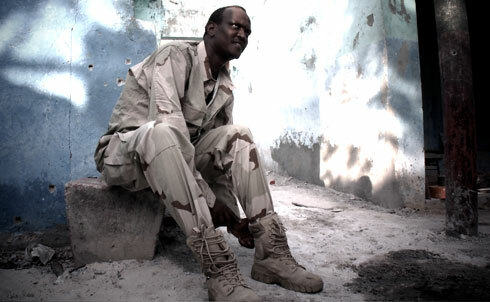 Noor puts on a new pair of combat boots near a frontline where his forces fought the Shabab in Mogadishu. Noor has guided the transformation of ASWJ from a nonviolent, quasi-political organization to a paramilitary group. His militia has received support and training from Ethiopia and a private security firm, Southern Ace, which was accused by the UN of “egregious” violations of an arms embargo on Somalia. Many of ASWJ’s frontline fighters are young Koranic students who have been deployed in the fight against the Shabab. “They are the ones who go to the frontline,” says Noor. 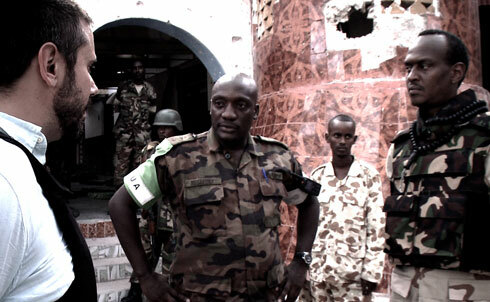 A Ugandan AMISOM commander outside of an ASWJ mosque recently retaken from Al Shabab. AMISOM forces work closely with various militias. “The resort to Somali proxy forces by foreign Governments represents a potential return to the ‘warlordism’ of the 1990s and early 2000s, which has historically proved to be counterproductive,” the UN concluded in a recent report on Somalia. 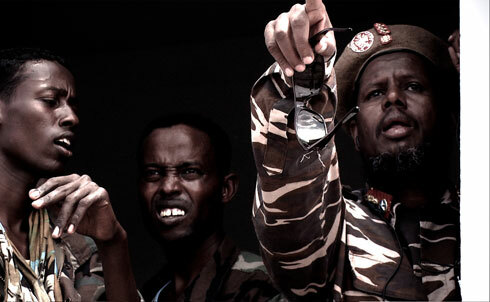 Sheik Ahmed Mohammed Islam, also known as Madobe, or “Black,” is the leader of the Ras Kamboni militia that operates along the Kenya-Somalia border. In 2007, as a leader of the Islamic Courts Union, he was targeted for assassination by the elite Joint Special Operations Command. He survived the assault, but was rendered to Ethiopia. Today, he is fighting against the Shabab. 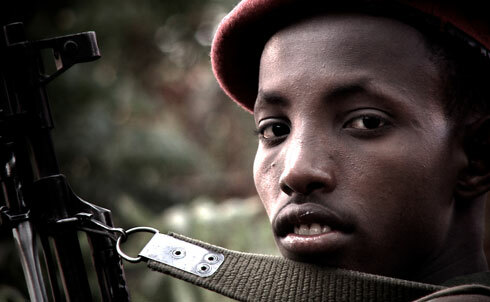 A Ras Kamboni fighter under the command of Ahmed Madobe. 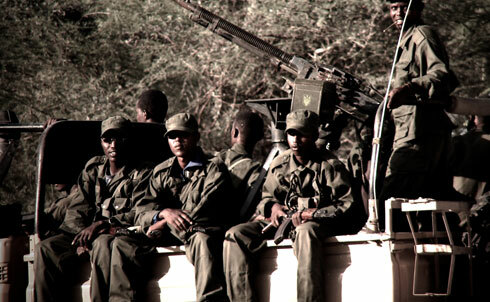 Ras Kamboni fighters on a “technical,” a pick-up truck equipped with a heavy weapon, near Dhobley, Somalia. For more on the US proxy wars in the horn of Africa, read Scahill’s article in this week’s issue of The Nation, “Blowback in Somalia.” For more from Scahill’s reporting from the region, read his article on “The CIA’s Secret Sites in Somalia,” from the August 1-8 issue of The Nation. For more from Richard Rowley, visit Big Noise Films’s website.